Aren't these adorable? 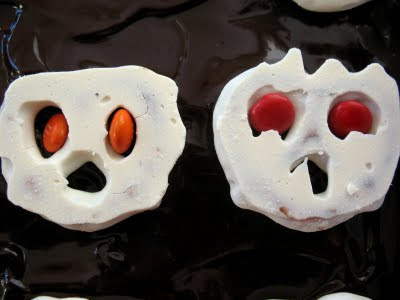 Yogurt coated pretzels make fantastic ghoulish faces with out any effort whatsoever! 1. Bake One Bowl Brownies. I added some white chocolate chips instead of nuts, for effect. Allow to cool. 2. Make the glaze and pour over top of the brownies, spreading and smoothing to cover them evenly. 3. While the glaze is still liquidy, place the pretzels on top. I placed them 4 across, in 6 rows. 4. 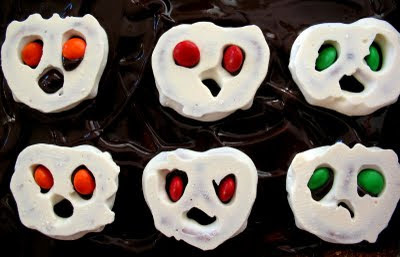 Gently pop in the Mini M&Ms. Careful not to get the glaze on your fingers and mess up the pretzels. If you get some on your fingers, just lick it off. 5. Allow glaze to cool and harden a bit. While it was still soft I sliced the brownies, then put them on a pan in a single layer in the fridge to harden up. Store brownies in an airtight container.